The Sugar Bowl will serve as Michigan's first trip to a BCS game since the 2007 Rose Bowl. The Wolverines lost that game to USC, 32-18. One year later, Michigan made it to the Capital One Bowl and beat the Tim Tebow-led Florida Gators in Lloyd Carr's last game as head coach. Rich Rodriguez's first two seasons didn't produce any trips to bowl games, but last year Michigan made it to the Gator Bowl. It was a forgettable trip, though. Mississippi State blasted Michigan by a score of 52-14. 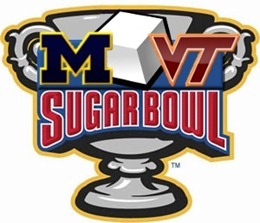 Michigan has only played in the Sugar Bowl once before in its history. The Wolverines lost to Auburn by a score of 9-7 in the 1984 edition of the game to finish with a 9-3 record. This year Michigan has already won 10 games, meaning a win over Virginia Tech would give the Wolverines their first 11-win season since 2006. What is this strange sensation that I'm feeling inside? 'Tis a feeling I've not felt in some time. Ah yes, it's the feeling that comes with being able to root for a football team that is...what is the word...good. Anyway, I've come to appreciate certain things a whole lot more after enduring the past few years as a Michigan fan. These things include winning seasons, playing defense, field goals, beating opponents you're expected to beat, and going to bowl games that may even include the possibility of winning them. "Michigan sat home tonight on the couch and watched us," the senior said shortly after the game's conclusion. "We played our hearts out — you saw it. I don't see how you get punished for playing and someone else gets to sit on the couch and get what they want. "If this is the way the system is, I guess it's a broken system." Michigan senior defensive lineman Ryan Van Bergen, who has become something of a team spokesman on a lot of matters this year, weighed in on Cousins' comments Sunday, shortly after learning of the Wolverines' bowl fate. His message: Want to trade? "If he wants to go sit on a couch and watch us play in the Big Ten championship game, then he can do that," Van Bergen said. "They had an opportunity to go the Rose Bowl. It was sitting right in front of them for them to grab. They didn't seize the opportunity. "I think that they'll do well in the Outback Bowl. Best of luck. Best wishes. We're going to the Sugar Bowl, and we're excited about it." MSU did indeed beat Michigan in October. However, MSU also lost in convincing fashion to both Notre Dame and Nebraska, both of whom Michigan beat. Also, call me crazy but I'm pretty sure that 10-2 is better than 10-3. As Van Bergen said, they had their shot to go to a BCS game and Spartied their way out of it when one of their players roughed Wisconsin's kicker near the end of the Big Ten title game. Generally, there is room to argue that the Big Ten runner-up should be considered for a BCS game, but the particulars make that more complicated. 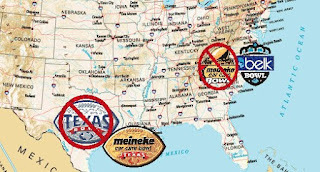 Of course, I think the choices for the BCS Title game are bogus, so none of us are happy are we? On a related note, I plan to be in Ann Arbor this next fall when this last and most annoying (and that's saying something) losing streak comes to an end. Good luck in the Outback, Sparty. First there was the Rose. At this point let's not pretend like this wasn't a marketing ploy because the entire point of the Rose Bowl was to prove to skeptical Easterners that it really is sunny and 70 in January in Pasadena. But at some point the marketing went from "come see our lovely town" to how much can we annoy you. This is where I come in. I carry a keyboard. When there were fewer bowls the funny names were okay, especially when they matched the local industry. The Citrus and Tangerine and Orange and Gator screamed Florida. The Peach was very Georgia. The Liberty Bowl at least began in Philly and had a logo of the Liberty Bell. The Refrigerator Bowl was in the Refrigerator Capital of the World—if you knew where that was you could place the bowl game. With naming rights to bowls now going for less than Pryor made in extra benefits (oh snap!) it is time to revolt. Going with this week's theme of whining about things that will never happen, here's my plea to readers and bloggers alike for dealing with the billions of bad names and barnacle-like corporate monikers affixing themselves to your bowls. Why care? Without getting into the mercenary finances of the bowls I don't care that companies buy naming rights. I care that they are very bad at it, and that this makes the bowlscape very unhelpful. It is not my intent to restrict or confine or dictate language. I'm just tired of having to Google where the Maaco Bowl is. Nothing to add, really. Just read the whole thing. It's pretty amusing. Go Blue. Beat the Hokies!